Danforth is a town in Washington County, Maine, United States. The town was named for proprietor Thomas Danforth. The population was 589 at the 2010 census. East Grand High School is located in Danforth. According to the United States Census Bureau, the town has a total area of 60.46 square miles (156.59 km2), of which, 54.00 square miles (139.86 km2) of it is land and 6.46 square miles (16.73 km2) is water. This climatic region is typified by large seasonal temperature differences, with warm to hot (and often humid) summers and cold (sometimes severely cold) winters. According to the Köppen Climate Classification system, Danforth has a humid continental climate, abbreviated "Dfb" on climate maps. As of the census of 2010, there were 589 people, 249 households, and 164 families residing in the town. The population density was 10.9 inhabitants per square mile (4.2/km2). There were 582 housing units at an average density of 10.8 per square mile (4.2/km2). The racial makeup of the town was 95.6% White, 0.2% African American, 1.2% Native American, 1.0% from other races, and 2.0% from two or more races. Hispanic or Latino of any race were 0.2% of the population. There were 249 households of which 26.5% had children under the age of 18 living with them, 47.0% were married couples living together, 10.8% had a female householder with no husband present, 8.0% had a male householder with no wife present, and 34.1% were non-families. 29.7% of all households were made up of individuals and 10.8% had someone living alone who was 65 years of age or older. The average household size was 2.33 and the average family size was 2.76. The median age in the town was 46.3 years. 20.9% of residents were under the age of 18; 6.9% were between the ages of 18 and 24; 21% were from 25 to 44; 30.6% were from 45 to 64; and 20.7% were 65 years of age or older. The gender makeup of the town was 50.4% male and 49.6% female. As of the census of 2000, there were 629 people, 263 households, and 175 families residing in the town. The population density was 11.6 people per square mile (4.5/km²). There were 544 housing units at an average density of 10.0 per square mile (3.9/km²). The racial makeup of the town was 99.68% White, 0.16% Native American and 0.16% Asian. There were 263 households out of which 28.1% had children under the age of 18 living with them, 49.4% were married couples living together, 12.2% had a female householder with no husband present, and 33.1% were non-families. 30.4% of all households were made up of individuals and 16.7% had someone living alone who was 65 years of age or older. The average household size was 2.34 and the average family size was 2.84. In the town, the population was spread out with 23.7% under the age of 18, 4.8% from 18 to 24, 22.6% from 25 to 44, 27.7% from 45 to 64, and 21.3% who were 65 years of age or older. The median age was 44 years. For every 100 females, there were 101.6 males. For every 100 females age 18 and over, there were 94.3 males. The median income for a household in the town was $20,769, and the median income for a family was $25,341. Males had a median income of $32,083 versus $17,083 for females. The per capita income for the town was $11,079. About 21.6% of families and 23.4% of the population were below the poverty line, including 27.2% of those under age 18 and 18.4% of those age 65 or over. ^ "Profile for Danforth, Maine". ePodunk. Retrieved 2010-05-08. 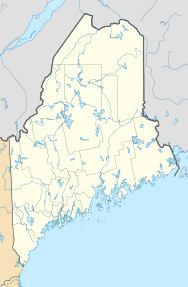 ^ "Profile of General Population and Housing Characteristics: 2010 Demographic Profile Data (DP-1): Danforth town, Washington County, Maine". U.S. Census Bureau, American Factfinder. Archived from the original on September 11, 2013. Retrieved July 20, 2012. This page was last edited on 25 June 2018, at 14:24 (UTC).